Michael Harrison, Executive Chef was on the June 5, 2011 "Travel with Stephanie Abrams!" Radio Show in hour 1. June 05, 2011: - 8:39 minute segment. 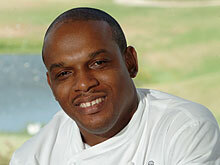 Chef Harrison recently joined Almond Resorts as the Executive Chef at its St.Lucia property, Almond Morgan Bay. He was formerly the Executive Chef at the North Island Resort in the Seychelles and has also worked as Chef de Cuisine at the world famous Sandy Lane Hotel as well as the luxurious Fairmont Royal Pavilion in Barbados. He started his career in the Culinary Arts in 1989 at the Barbados Community College Division of Hospitality Studies. Upon completion of his studies, he assumed the post of Chef de Partie at Cobblers Cove Relais and Chateaux a position he held for three years. His talents have been honed and further refined in such world renowned establishments as Gleneagles Hotel in Scotland, Le Gavroche Restaurant in London , La Maison Restaurant and Carabola Restaurant in Barbados, as well as the White Barn Inn located in Maine, itself a prestigious Five Diamond Hotel. It was here that he had the distinct honor of preparing dinner for former U.S President George W. Bush, who complimented him on the exceptional quality of his work. Additionally he has served under the tutelage of Chef Michelle Roux Jr. of world renown at Le Gavroche Restaurant in London. Chef Michael has worked as a guest Chef under the auspices of the Barbados Tourism Authority in such establishments as the Patroon Restaurant in New York and Restaurant L in Boston. Michael prides himself on sourcing fresh produce picked or caught fresh in St. Lucia and explains that St. Lucia abounds with fresh fruits and vegetebles as well as seafood and fish. He avoids using fish not sourced locally, like salmon and raves about his prawns. He considers himself very fortunate to be able to call up his suppliers, request 50 pounds of prawns, and have them delivered freshly caught within hours. To sample his wares and hear more from Michael click the listen now button above.